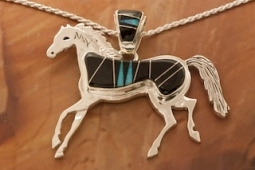 Genuine Acoma Jet inlaid in Sterling Silver Horse Pendant. Accented with Fire and Ice Lab Opals. Free 18" Sterling Silver Chain with purchase of pendant. Designed by Navajo Artist Calvin Begay. Signed by the artist. Pendant is 1 1/2" L including the bale x 2" W.